After treading lightly with our no spoiler review, it’s time to delve into Episode VII in a bit more detail and discuss why exactly we rated this film so highly. The story itself was straightforward and played safe by writers Abrams and Kasdan, as it didn’t take any unnecessary plot turns or take from any of the crazier fan theories out there. That’s not to suggest that the film was boring, it was far from it. 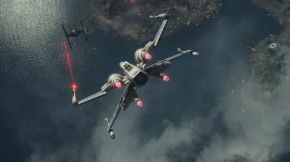 It still contained the excitement, action and humour we’ve all come to expect from a Star Wars film but this new one needed a grounded and familiar storyline for it to be taken seriously, and they certainly delivered on that front. Talking of familiarity, Episode VII went back to basics, ignoring the political drama of the prequels and instead welcoming in again the battle of good versus evil that made the original trilogy so popular. The storyline did at times seem a little too like Episode IV: A New Hope with the destruction of a Death Star type planet, an all important droid with hidden information and a young force user hidden away on a sandy planet in the Outer Rim. However, what J.J. Abrams has given us here is a film that pays complete homage to the original trilogy by acknowledging why there were so popular and then building his own story around it. He included all the elements from the episodes IV-VI that made Star Wars what it is; action, suspense, love, humour and above all the complete optimism Star Wars gives to everyone watching it. What the prequels lacked were these elements because they were too wrapped around the story of Anakin becoming Darth Vader and the political struggles the Emperor caused in sustaining his power. Whilst they were interesting ideas, they were just not the right fit for a Star Wars film and this is something J.J. cleverly avoids. The film really gathers its strength from its lead characters, both light side and dark. We’re given three young lead characters that carry the film in a fantastic manner. We’re given a three dimensional villain in the form of Kylo Ren, a young sith lord so powerful he can extract thoughts from others minds and stop a bullet in mid air. Not to mention his conflicted personality and confused mind regarding his choice to join the dark side. This is played with a lot throughout the film and it really shows just what a great character Ren is. The reveal that he is the Son of Han and Leia and the pupil who destroyed Luke’s new Jedi order also gave extra weight to his already conflicted character. He’s not just another completely evil, dull villain. He acknowledges his weaknesses and addresses them and he shows his anger, like all young sith lords would. After all, anger and hatred are what drives one to the dark side in the first place and this is evident with Kylo Ren. With Finn, we’re given another character that was conflicted and confused about his own position in life. His whole life had been spent training as a Stormtrooper, with his only name being FN-2187. His choice to run away from that evil and eventually help in fighting against them again gives us another character that we can all relate too and be excited about. He may not be a Jedi or a Sith lord but he’s an ordinary hero looking for an escape and any chance to help. Finn will most likely have a bigger role in the films to come but for now, J.J. and John Boyega can be happy with the funny and very likeable character they have given us. Rey is probably the most interesting of the three, given her mysterious past and future. You’re given the sense of a very similar character to Luke in that she has no parents she knows of, she’s alone and wanting to escape her planet and that she’s made for something more. The promotion for the film and merchandising really pushed Finn as the one who would pick up the lightsabre and the Jedi mantle so it was a nice twist when it’s revealed Rey is actually the one with the use of the force. She scares Kylo Ren and even, though she doesn’t know them, hears from Yoda and Obi-Wan in her visions from touching Luke’s old lightsabre. She even uses a little old Jedi mind trick on an unsuspecting Stormtrooper to escape her cell, a nice throwback to Alec Guinness in Episode IV. Her acceptance of the force, after some initial reluctance to it even sees her nearly defeat Ren in battle at the films climax. However, we still don’t know everything about Rey and her powers but that’s definitely a good thing to ponder as we wait for Episode VIII. Again, J.J. Abrams should be proud of providing us with another completely likeable and amazing hero. Honourable mentions should go to BB-8, our new loveable droid who through his important part in the film provides us with humour and heart, Poe Dameron, the Resistance pilot with the cool, assured personality, General Hux, First Order General and rival to Kylo Ren, his rally speech to his Stormtroopers being one of the best scenes in the film. Gwendoline Christie’s Captain Phasma turned out to be a little disappointing so hopefully that will be redeemed in Episode VIII. The return of Han Solo and Leia was also a joy to behold, despite the latters lack of screen time and not to mention old favourites Chewie, C3-PO and R2-D2, with the droids giving us a classic throwback to their old bickering. The film gives us everything we hoped to expect from a Star Wars film. It gives us highs and lows, the highs being that it has a case for being the funniest film of the seven, credit due to John Boyega and those in control of BB-8 for that part and its action sequences are huge and loud and they didn’t disappoint on a very cool lightsabre fight. The lows gave us breathtaking and heartbreaking scenes, including the loss of our favourite smuggler Han Solo to his son and enemy Ben/Kylo. That scene was absolutely necessary for Kylo Ren’s development as our main villain as much as we didn’t want to see it. J.J. too includes a lot of old favourite characters and moments. We see General Ackbar and Nien Nunb return with the Resistance, a whole host of creatures in the Jakku junkyard and the return of TIE-Fighters and Star Destroyers. J.J. also threw in two throwback sunset stills, which was a nice nod to the famous binary sunset scene with Luke in A New Hope. Seeing the Millennium Falcon was a joy also, as well as Rey mentioning how it did the Kessel Run in less than 14 parsecs to be quickly corrected by Han. An intergalactic bar scene was also included that was definitely a nod to the cantina in Mos Eisley spaceport. It’s clear to see that a lot of love went into making this film and that it was made by people who absolutely cared about Star Wars. From the hidden creatures to nods to the original trilogy and from returning favourites to new ones, this was, to simply put it, a brilliant Star Wars film, made for the fans by the fans.